So I have this really bad habit of assuming that a size 6.5 or 7.5 will fit me simply because I want them to, even though I actually wear a size 7. That's what happened with these Seychelles leather vintage-inspired sandals. 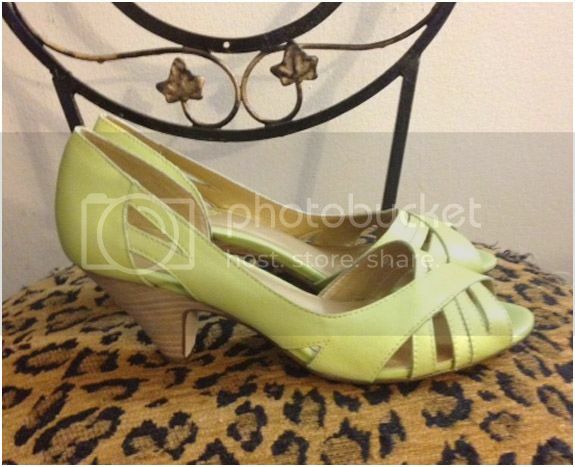 I loved the Limoncello color and style so I bought them anyway, thinking that I'd make a 7.5 work. Wrong! My toes barely extend into the toe opening. But my mistake is your gain! I've never worn them outside my home, but I have tried them on a few times. Hence, the small amount of dirt on the sole. Other than that, these shoes are in excellent condition. The heel is the perfect walkable height, approximately 3 inches high. Includes original dust bag and box. I had plans to wear these with a retro rockabilly vibe -- cuffed jeans, a chambray top, and a turband -- but they'll also work with skirts and dresses and even twill pants. I'm letting these go for $20!